A 30 to 80 per cent increase in rod life, more accurate collaring and straighter blast-holes are the main benefits of Alpha 330, a brand new tool system developed by Sandvik. Designed to exploit the power of 20kW drifters to drill small-diameter holes faster, Alpha 330 signals a new era of rock-tool economy. Even an amateur knows it is no good using a big hammer to drive a small nail. The same principle applies in percussive rock-drilling, which is why manufacturers go to great lengths to match the strength of the drilling tools with the impact energy of the rock drill. But what happens when market forces demand both a big hammer and a small nail? The analogy reflects what has happened in drifting and tunnelling with cross-sections up to 50m2. In a nutshell, mining and civil engineers are keen to exploit the power and speed of 20kW rock drills in order to raise productivity, yet insist on keeping the bit diameter small – 45mm to be precise. The snag is that the conventional R32 thread at the front of drifter rods for 45mm bits – nominally the biggest thread possible – is not quite man enough for the punishment meted out by 20kW machines, especially when the predominant rock resistance presents itself to the drill bit obliquely, causing the rod to bend. Breakages occur typically at the gooseneck between the full rod-section and the R32 thread. 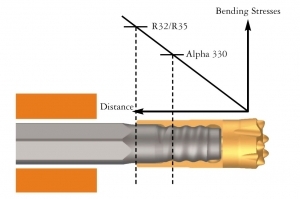 With Alpha 330, which has a much more robust connection between the rod and bit, the frequency of such breakages is a thing of the past. The resultant tool economy, together with more accurate collaring and straighter holes that give better fragmentation and improved profile-control, brings down the overall cost of drifting and tunnelling yet again. According to Anders Brungs, research and development manager at Sandvik Tools, the popular, world-standard R32 tool joint has been developed as far as possible. “It is a very good tool system for rock drills with impact power ratings up to about fifteen kilowatts,” he says, “but beyond that you need something more robust”. With so many customers insisting on sticking with 45-mm bits, however, Sandvik was limited in how much it could strengthen the joint simply by increasing the thread diameter, and had therefore to look at the design itself. Brungs and his colleagues explored a number of design avenues, including that of a tapered thread. Their primary aim was to minimize the effects of the reactive bending forces that cause the drill bit – under the influence of feed force, impact power and rotation – to deflect when collaring holes into the many oblique surfaces on the average drift or tunnel face, or when drilling into cracks or oblique changes in rock resistance inside the hole. FME analyses indicated repeatedly that the best way to increase the resistance of a drifter rod’s weakest point – the thread at the front of the rod – is to make the thread as short as possible. The effect is to move the weakest point of the rod forward and reduce the leverage of reactive bending forces on the threaded section as a whole. With a smaller moment of force acting on the weakest point, the front of the rod becomes proportionately less susceptible to bending and breakage. 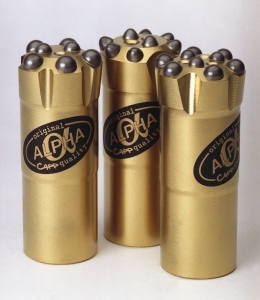 The Alpha 330 system benefits further from the inherently stronger and more rigid R33 thread. Although only 1 millimetre larger in diameter, R33 has a 14 per cent larger cross-section than R32 and is therefore proportionately stronger, even without the benefits of a shorter thread. To improve rigidity still further, Sandvik has introduced a new guiding function between the rod and bit-skirt, immediately behind the thread. The provision of a snug interface at this crucial point at the rear of the connection greatly improves the rigidity of the joint. After the bit skirt, the rod cross-section increases to Hex-35 quickly and smoothly, without the typical gooseneck that is so vulnerable to bending, as well as to sandblasting by the drill cuttings. What is more, since the bit skirt covers the thread completely in the Alpha 330 connection, no part of the thread itself is exposed to sandblasting either. This reduces the risk of corrosion-fatigue, a common menace in rock drilling tools. Exhaustive tests in aggressive, real-time mining environments in Australia and Canada have shown the service life of Alpha 330 to be from 30 to 80 per cent longer than that of R32. Most engineers are familiar with the term ‘impact power’ as a means of rating rock-drill capacity. To arrive at the impact power of a rock drill, one has first to determine its impact energy. Expressed in joules, the impact energy is the product of the piston mass and the impact velocity, i.e. the speed at which the piston strikes the shank adapter. The impact power, expressed in watts, is then a product of the impact energy in joules times the impact frequency in hertz. What is important to understand is that different relationships between impact energy and impact frequency can give the same impact power. In other words, a rock drill with low impact energy and high impact frequency can have the same impact power rating as one with high impact energy and low impact frequency. In addition to other factors, especially the geometry of the rock-drill piston, this greatly affects the load to which the tool system is subjected, and hence its service life. It also indicates whether the machine is suitable for hard or soft rock. A lighter blow at a higher frequency is suitable for softer rock. In hard rock, the lighter blow does not impart enough impact energy to crush the rock efficiently, and this is reflected in a poor penetration rate. Strike the tool system too hard, however, and the impact energy destroys it, especially when applied in combination with high bending stresses. Where there is good synergy, the tool system is able to transmit the total output of the rock drill into the rock with maximum effect for the longest possible time, and therefore efficiently and economically. Reducing the percussion pressure will reduce the impact power and prolong the life of the tool system. In hard rock, however, it will also reduce the penetration rate. The solution, says Sandvik, is not to turn down the percussion pressure, but to keep developing the strength of the tool system, and Alpha 330 is a big step in this direction. The demand for small blast holes – drilled faster, deeper, more accurately and more economically – is easy to understand. Increasing the hole diameter to enable the use of more powerful rock drills and bigger tool systems can work in surface benching applications, since it is feasible to increase the burden and spacing when blasting toward two free faces. Indeed, doing so can have big economic advantages. In drifting and tunnelling, where there is just one free face, the situation is very different. In excavations with cross-sections up to about 50 m2, 45 mm is a de facto standard, particularly in the mining sector, not least because it is pretty close to the optimum blast-hole diameter for small to medium size faces. The rock can be fragmented satisfactorily at reasonable cost with today’s explosives – mainly bulk explosives – a good pull can be obtained and overbreak can be kept within acceptable limits. Since increasing the hole diameter would permit the burden and spacing to be increased only marginally, roughly the same number of holes would have to be drilled. Bigger holes would therefore yield nothing. They would simply inflate the cost of rock drilling, increase the specific charge and the consumption of explosives, and raise the risk of overbreak. Thanks to companies like Sandvik, the cost of drifting and tunnelling has fallen for more than 100 years in succession. Between 1900 and 2000, productivity in the drilling cycle rose from about 15 to over 250 drillmetres per hour, an increase of around 1600 per cent. The drive to automate drill-rig functions and increase penetration rates continues unabated, fuelled by a mixture of bilateral market forces and increasing technological expertise. With today’s rock drills able to generate almost unlimited impact power, there is now more emphasis on controlling such power and, most importantly, ensuring that it is transmitted into the rock as efficiently, accurately and economically possible. That is the job of the rock drilling tools, which is why Sandvik has taken the development of the Alpha 330 tool system – the small nail for big hammers – so seriously.